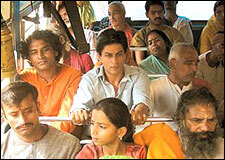 Swades, a Hindi movie, is not currently screening in Hyderabad. What is it about Shah Rukh Khan that inspires extreme emotions? What is it about him that gives his movies bumper openings? What is it about him that our women just can't have enough of? In other words, what is it about Shah Rukh Khan that makes even his most zealous detractors appreciate him once in a while? fullhyd.com has 700,000+ monthly visits. Tell Hyderabad what you feel about Swades, and then also see all user reviews for Swades!